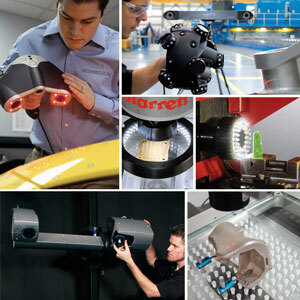 Dimensional inspection is used in a broad range of industries for a wide variety of applications. However, there are some common reasons why this type of measurement is used. Whether the objective is to compare a prototype to a drawing or to ensure that a finished product meets certain standards, the fundamentals of dimensional inspection remain the same. Highly accurate measurements are taken to determine how closely an object matches its originally intended dimensions. In general, if dimensional measurement is required, the results must be both accurate and precise. Although multiple techniques and countless applications exist, there are four main categories of dimensional inspection. First article inspection. Implementing a manufacturing process requires extreme attention to detail, especially if the process is new or if the equipment has been specially designed. First article inspection is required to ensure that the equipment was properly installed and calibrated, and to verify the manufacturing process. Dimensional measurement is used to compare the first objects from the manufacturing line to 3-D CAD models or other specifications. Quality control. When objects coming off a manufacturing line must meet certain quality standards, measurement equipment is used to confirm that the dimensions fall within the required tolerance levels. 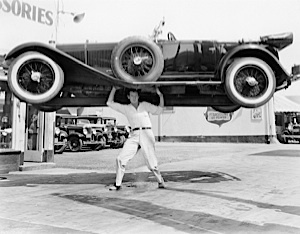 In some cases, when the tolerance levels are more rigorous, each object is measured automatically. In other cases, batches might be spot-checked for quality. Regulatory compliance. In industries for which regulatory compliance is necessary, dimensional measurement ensures that the required specifications are met. Regulatory bodies such as the FDA or FAA often have requirements regarding the dimensions of certain components. High-precision engineering. When creating a larger assembly from smaller parts, high precision is often required. If a minor flaw or inconsistency can impact an entire process, ensuring that such imperfections do not exist is critical. Employing dimensional measurement in these scenarios offers many benefits, including reduced liability, improved quality, and lower costs. If you need dimensional inspection services for your business, contact the professionals at Q-PLUS Labs. We provide outsourced measurement services for a range of industries including manufacturing, aerospace, medical, and more. Schedule a consultation today to learn more about how we can help you with your dimensional measurement needs. How does your company use dimensional inspection? Dimensional inspection can be performed with a wide variety of methods and equipment, depending on the object being measured. When selecting equipment, remember the cardinal rule of dimensional inspection: The object being measured cannot be altered during the measurement process. This means that some objects cannot be touched because the resulting measurements will be inaccurate. Examples include objects such as micro-gears, rubber gaskets, prosthetics made of soft plastic, or a fragile antique with a delicate surface. 3D scanners. There are two main types of 3D scanners: those that use structured light and those that use lasers. In both cases, light is projected onto the surface of an object and measurements are made based on the reaction of the light. With structured light, the distances are measured using the distortion of pixels, and with lasers, the reflection is used to triangulate distances. Clearly, the surface characteristics are a significant factor in determining whether 3D scanning should be used. Optical comparators. When light is projected onto an object, its resulting shadow or silhouette can be used to take measurements or compare the shape to the specifications. Fiber optic technology can also be used for edge detection. Vision systems. This type of equipment uses a similar concept to optical comparators in that light is projected onto a screen. However, vision systems also use cameras or zoom optics to relay an image to a display. Other accessories such as edge detection, touch probes, other types of sensors, and automation technology can also often be integrated into these systems. 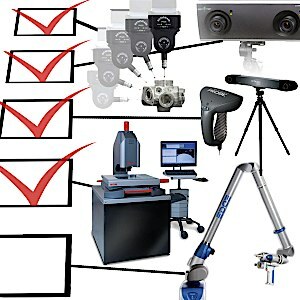 If you're not sure what type of dimensional inspection equipment makes the most sense for your application, working with an expert is best to ensure accurate results. Q-PLUS Labs provides in-house or on-site dimensional measurement services for virtually any industry or application. What types of objects do you need to measure? Do you think that using a non-contact sensor is the best approach?